The struggle to reach the professional tour in this game is real. It’s a tale that’s told by the look on a face, the projection of a tone, the desperate travel plans made at the 9th hour, and the perceived desire in ones words. This Sunday I went to a Pro Tour Qualifier in Chicago, and this time it felt different. They always stir up familiar emotions and passions, but this particular one covered a lifetime of experiences in one very long day. The good, the bad, the ugly; they were all there. A few weeks ago I was talking with local grinder Louis Kaplan, and we were comparing our endless string of “almost” getting there tournaments. And by “there” I mean that coveted blue envelope that means more than the world to many competitive Magic players. Making the Pro Tour has been one of my biggest dreams since I was young, and while time is against me, the fire burns as bright as ever right now to try and fulfill that dream. Last Monday I was browsing Facebook, when I noticed a notification pop up. I clicked on it to read “Alan Hochman with Pastimes Games is hosting a $5,000 Prize PTQ in Chicago”. I haven’t seen PTQs mixed with cash payouts before, although other players were quickly informing me that these things have been around for a while. Regardless, this was a very reasonable reward for your time and effort if for some reason you don’t get to make a dream come true. I shared the post with my town’s MTG group, and discussion started on who all was going. There were a few of the regular grinders who already had it planned, along with hitting either Minneapolis or St. Louis the day before for a double-PTQ special. Sadly all the cars were full, and most of my usual crew were in complete boycott of Pastimes after their experiences at the recent Grand Prix. I looked in my wallet. Heck, not even a ball of lint. Credit Cards stretched to the brim as usual, savings tapped, bills to pay. Brakes on the car squealing. Just finished the tail end of a two-week long move across apartments. Work crazy as usual. 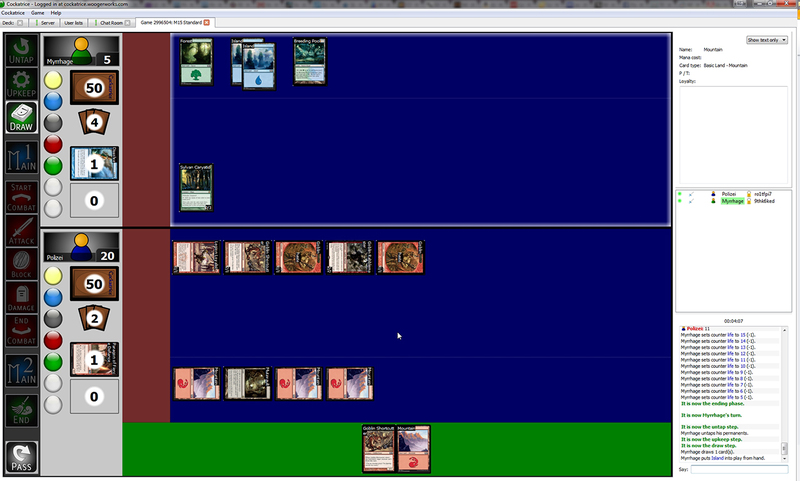 My playtesting of Nicholas Heal’s GP Minneapolis Red Deck Wins build had been going poorly. I’m thirty years old, and probably starting a family in the next few years, and the last thing my wife needs is another weekend where I’m running away to play a game that I’ve played since I was ten. Those are a few of the million reasons I had not to go. But the dream. . . I hopped on Cockatrice. It’s not the greatest testing tool, but it lets you put yourself through the paces of a deck easy enough and you can scour for good opponents if you’re patient. I eventually settled into playing a few games with a guy and we started having some conversation in chat. He was from Finland, and he was looking to play in his country’s WMCQ soon. He was worried he wasn’t going to have enough Planeswalker Points because there was only one other big tournament in his area and it was two weeks before the WMCQ. It was 100 miles away and there literally weren’t any other major tournaments over the course of an entire year except for these two. This made me pull up my DCI number online to compare some things, and I clicked over on the history tab to relive some nostalgia. My first big tournament listed was a PTQ from January, 1999. Fifteen years ago. My god. FIFTEEN YEARS! It just seemed so unreal even though I remember the days. But more importantly, it reminded me, this isn’t “just a game”, this is a dream. I know I’m coming across super serious in this article, but this look back hammered it home for me. There’s no point to let all this time, effort, and passion go to waste, you have to keep battling to get what you want. And here I’ve been given the opportunity to play in multiple high level events every single weekend. Of course like anyone with an actual social life outside of Magic I can’t do that, but it still gives me no excuse to let chances slip through my fingers if I can make something happen. I thought, if anything, I kind of like what the local pros who I really respect have played or listed recently, so probably best to crowdsource them and see what feels best to me. I messaged Jasper Johnson-Epstein and Adrian Sullivan to see where their updated Burn lists were at. Adrian messaged me back briefly but didn’t sound terribly confident about the deck. Jasper messaged me back an updated build and sideboard plan, and things looked good so I began to assemble the cards. I tested online a bunch over the course of a day or two, and then at 11pm after a long afternoon of drinking with friends I got a little Facebook ding from Adrian right as I was about to hit the hay. The gist of it was, I should play his GR Burn list because it was better positioned, had Ghor Clan, and while he still thought Burn wasn’t a good choice at the moment, it was the better list. I respect the hell out of both of these guys after watching them ascend to greatness many times, and because they’re both excellent Red mages. My brain was racked, so I wasn’t sure what to do and went to sleep. It’s fine to cut a Mountain on the draw much of the time, but not great when bringing in three-mana spells and/or Searing Blazes. UWR: +1 Skullcrack, +1 Sudden Shock, +2 Volcanic Fallout, [+1 Flamebreak if they show Geist], -2 Searing Blaze, -1 Vexing Devil, -1 Vexing Devil (play)/-1 Mountain (draw), [-1 Vexing Devil if they show Geist] Combust isn’t usually good here, but some builds have Baneslayers and Restos along with the Colonnades, so season to taste. Storm: +1 Grafdigger’s Cage, +1 Rakdos Charm, +1 Rakdos Charm (draw), -2 Searing Blaze, -1 Mountain (draw) Skullcrack isn’t great, and Fallout has some real utility if they show Empty the Warrens. The tournament site was an old standby that I had been to several times, the Odeum in Villa Park, IL. Let’s just say this thing was not built for a Magic tournament, yet because the greater Chicago area is apparently “limited” with regards to affordable venues, it’s used over and over again by Pastimes. I went to a Regionals there in the early 2000s, and Magic players were playing Soccer on an indoor Soccer field. Only, this was the same indoor Soccer field that the Regionals event was also being played on. Yeah. . . . . It was hot in the main event room at this current PTQ. So much so that I was literally sweating through my shirt and having trouble concentrating for a while. Granted, I’m on the heavier side, although certainly no Boggart Ram-Gang. But the dream. . . This matchup seems to favor the Burn side, but it’s a tough deck and can go either way depending on draws. I was playing against Greg who is a reasonable player from the Chicago area, and the games were very close. The main thing here is that you’re faster than them, and you want to dump your initial hand as fast as you possibly can so that you can avoid them getting any value out of their Liliana once it comes down. Scavenging Ooze and Discard are your worst enemies, followed by Obstinate Baloth and Batterskull out of the sideboard. Thus, Skullcrack is very live, as is Sudden Shock since it kills Ooze at times before it can get out of control. Sometimes you run out of gas, but if you don’t, they usually can’t keep up. Vexing Devil is pretty awful here other than providing tempo, so following the Jund sideboard plan worked well for me. Fortunately I had been casually testing this matchup with some friends before the tournament started so this was the perfect deck to line up against in Round 1. The Affinity matchup is absolutely nuts. Both decks are balls to the wall and are trying to out maneuver each other. Burn in this format definitely can’t afford to kill many creatures, so the more Searing Blaze “effects” you have, the better. Arcbound Ravager, Cranial Plating, and Vault Skirge are all major thorns in your side. In game 1 of this match, my opponent got two Signal Pests, a Memnite, and a Vault Skirge down within the first turn or two, and I was soon backpedaling trying to deal with the Skirge before the life imbalance cleaned my clock. Sadly killing creatures runs you out of gas and his army just kept piling on until I was very dead. Be willing to take a lot of damage in this matchup and stay dedicated to burning them. You only care about a few creatures, and if they have Etched Champion you’re probably in trouble. Game 2 you get to bring in almost your entire sideboard, so that helps slow them down quite a bit. 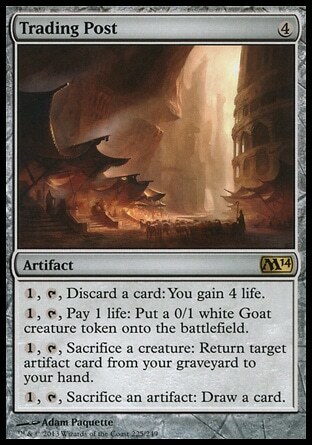 Stony Silence shuts off all the modular madness and Cranial Plating, your sweepers gain you critical value, and you have a lot of redundancy to try and make sure your removal sticks. Beware though, they often bring in Welding Jar or Spellskite, so you may need to save removal for these if you have enough to go around. In fact, game 2 of this match came down to just that, as I was piling on the burn to the point where my opponent was very low, only to watch him double galvanic blast me, play a Spellskite which I was forced to respond to with a Shard Volley, and then cry as I couldn’t draw a second land again to play my lethal Skullcrack in hand over the course of the next three turns. 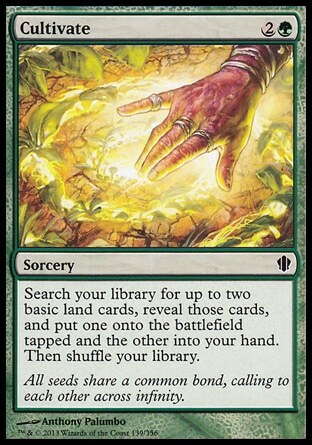 Also, be sure to be extremely careful with how you play out the lands in your hand; both the damage from your Shocks/Fetches and the ability to cast Searing Blazes on time are incredibly relevant. The burn mirror isn’t pleasant with this build because there’s really not a good sideboard plan for it and you have a lot more ways to damage yourself then they do (assuming they’re more Mono Red or strictly RW). You have to play your lands tapped as often as possible, trust your knowledge of the archetype, and put strength in the fact that you have higher impact / a greater redundancy of burn spells than they do. The Burn mirror could have its own detailed article all by itself, but in this round it really came down to who was on the play. There were a few mistakes my opponent made too, but in game 1 I won with him having lethal in hand, game 2 he did the same back to me, and game 3 I switched it up again. I experimented a lot more than I should have with my sideboard in this match, going so far as to bring in Spellskite to neuter all of his 3/4 damage burn. I don’t like that it’s an unaggressive card here, but the tech worked out in the game that I played it since he otherwise would have been able to kill me were I not able to reduce a lot of damage. Eidolon is something you have to be very careful with, but it’s an absolute monster when you’re on the play or if your opponent stumbles. It can also be a liability when you’re behind, so I’d like to hear thoughts on how others play it to get a gauge for different strategies. Personally I feel very comfortable playing him as I’ve been jamming it in Standard for a long time now, but I see many mages backing themself into a corner. This matchup honestly feels like it is a bye to me. They have scary scary cards that they can play, and turn 3 Tron is absolutely a thing, but if you have a half decent hand they don’t really have much of an answer. 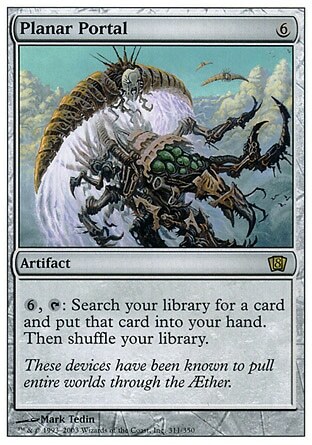 Wurmcoil Engine is the end game, so get your Skullcracks ready. I won this match very quickly with little trouble at all. Just be aggressive and know what cards are important and when they’re going for them. It isn’t always pretty though. I went over to watch Jasper playing against Gifts/Tron the following round, and as I come over I see chaos unfold. In game 2 Jasper’s opponent tries to cast a Sphinx’s Revelation which gets Skullcrack’d, he then tries to Unburial Rites an Elesh Norn into play but has his graveyard exiled by Rakdos Charm, and then his opponent follows up with a Wurmcoil Engine which then leads to Jasper top-decking a Lava Spike to kill him before the Engine has a chance to attack. Game 3 is even crazier as I see a Karn sitting on 11 counters, followed by an Oblivion Stone blowing up the world, leaving Jasper with 1 land in play and nothing else. Jasper then proceeds to Bump in the Night his opponent twice and that was all she wrote. Ah, the Fae. Any Red mage playing during Lorwyn/Shadowmoor will remember this awful menace of a deck, and its only become stronger in Modern. Now they have access to Pack Rat, along with better counter-magic and removal. In fact, another fellow Madison native Matt Severa made top 8 with it, and a different pilot that I don’t know was in the finals as I was leaving. It’s the ultimate tempo deck, but fortunately for you it plays Bitterblossom which is just the absolute worst against Burn, and you have a suite of sideboard cards that are uncounterable. These games were the most intense ones of the tournament for me, but it was a lot of fun. Both of you are largely playing at instant speed, and Grim Lavamancer + Eidolon of the Great Revel are beasts if left unchecked. Your spells are cheaper and have a higher impact, but they have a lot of cheap counter magic that can potentially run you out of gas. My biggest advice here would be to make sure you sandbag your uncounterables until the very last minute, and stretch each card as far as it will go. Your creatures are excellent diversions here, as all of them are either must kill or act as removal spells vs many of their creatures. Also worthy of note; do not bring in Combust unless you see some insanely specific reason for it. You want all damage cards here if possible to keep up with the pace. The only creature Combust kills that you even lightly care about is Mistbind Clique (or the Faerie it’s championing to be correct), and if that card is coming down most of your other burn spells can respond to it, or you simply don’t care at that point in the game. Rakdos Charm can be important too if they have access to Swords, Batterskull, or just as a finisher. I found Twin to be a difficult matchup, although Jasper is confident that it is not. As you can see from the sideboard notes, there are intricacies depending on the versions. The hardest part about playing against any deck like this, is if you play cautiously in anticipation of the “combo”, they can just attrition you out through native means. Game 1 I had no idea what was going on, I thought he was on UR Aggro which is seen a lot on MTGO (Delver, Pyromancer, Lavamancer), only to have him combo kill me six turns in. Game 2 we sparred blows and I was holding Rakdos Charm for his combo, but an early Spellskite was preventing my creatures from getting through. I held onto Charm too long (although he did have the combo in hand), and the game slipped away from me when it may have gone the other direction if I had immediately gone after Spellskite and then tried for the win the next turn. This was also a match where I kept a sketch one lander in game 1, and it did not pan out well. At least I didn’t feel too bad when my opponent went on to top 8, and we later had a discussion about how he too was a big grinder without a blue envelope. They are a slower combo deck than you, and you have disruption for most of their stall tactics (Spellskite, Obstinate Baloth, Nature’s Claim, etc). Skullcrack for their lifegain and Sudden Shock for Sakura Tribe-Elder are the keys, along with having any kind of half-decent hand. Game 2 was pretty hilarious, I had quadruple Eidolon of the Great Revel and had to Lightning Bolt him in response to me casting the third one because I almost forgot that I would have been dead to my own Bolt otherwise. Fortunately I caught it in time, and then he died to his unsuspending Search for Tomorrow during his upkeep before he could cast a second Obstinate Baloth. At this point it looked fairly clear that I would miss top 8, but top 16 was a reality. Cash payout to 32nd. A chance at revenge. The RUG version seems a little more durdely, and for the most part I liked that he was focused on a beatdown plan moreso than the combo. Games 1 and 2 were close, of which we split when the other person had the kill the next turn. To be fair, in game 1 I was again stuck on another 1 land sketch keep, so that should play up the strength of Burn even more considering the battles these games were. Game 3 I was cruising along just fine looking like things were going to be wrapped up shortly when all of a sudden a Huntmaster of the Fells hit the table. I didn’t have ways to interact with it immediately, and as a result he unloaded a flipping fiesta of lifegain and wolves until I was buried to death by an army. It was a new card addition that he had made between the PTQ he had attended the day before and this one. Looks like the change paid off. Make sure to note the sideboard differences on this one vs UR Twin. You play more creature removal here, mostly to keep tempo, but also for corner cases like this. I followed the board plan correctly, unfortunately I just couldn’t draw what was needed in time. My opponent was really hyper this round and it was throwing me on tilt. He had the energy of a five year old boy and was trying to make cheesy jokes from the minute we sat down. He introduced himself as Dac Fayden and kept trying to get me to acknowledge it. I on the other hand was incredibly drained from the day and just focusing on trying to make a little cash. I like socializing before and during matches, but I just wasn’t prepared for his over the top excitement. We went to three games, with a lot of similar interaction to the previous Affinity match, but ultimately he nickel and dimed me to death with Blinkmoth Nexus and tried to ask me to pick a color for his Mox Opal when I was dead on board. Sigh. I definitely could have had a better attitude for this match, but it just felt like the entire tournament was falling apart during it. The grind is real. . .
(Loss) 5-4. My opponent finished in 32nd. I congratulated him on the cash and went to do what I do best; play Purphoros in EDH. He had an article feature at Grand Prix Richmond for a strong finish with the previous iteration of the deck, it’s definitely worth checking out if you’re interested in playing the archetype. There are some weaknesses vs non-interactive decks, but otherwise this list is impressive. Davis is a cool cat, a die hard Red Mage, and a fellow Bulls fan to boot, so I couldn’t recommend his stuff any more here. Dropping a turn 1 Blood Moon on someone is for sure a place I’d like to be in Modern. And if you don’t like Koth, I don’t think I can fix your problems. 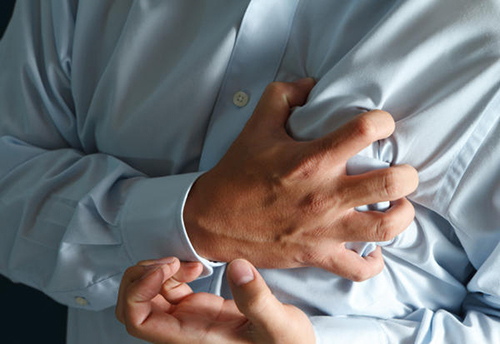 I know this article was a long one, but I’m sure a lot of it will resonate with my fellow grinders. And for all of you aspiring to become better Magic players and better Red players, please keep up the fight. Don’t give in to all the people telling you that you can’t win unless you play other decks. Practice, practice, and practice some more. That’s my biggest weakness despite how much time I do put into the game, but thankfully it’s always something that can be worked on. And while you should play other decks to gain useful knowledge from the process, when it comes to tournament time I always believe you have a better chance, well as Davis put it in the writeup, when you “play what you know”. Ooooooh Boy, a new Magic set! That favorite time of the year that gets everybody’s brewing senses tingling. 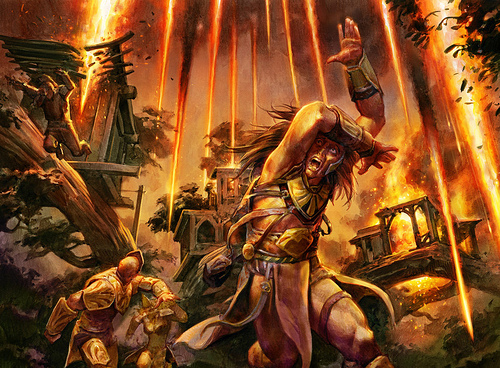 While a lot of people frown on core sets, Wizards has been doing a lot of work to try and make them feel more like an actual set, and M15 is the continuation of that effort. I also now have a soft spot for the core sets after top 4’ing a PTQ during the M14 Sealed season, so I’m looking forward to what this one will provide. Overall for Red I’m not wildly excited yet for much of the set, I think there’s a good amount of value overall throughout the pool of cards but Red doesn’t seemed to have gained much specifically for Standard. It’s early though, and cards tend to emerge as contenders only after being put through a lot of hard testing. I’m glad to see a lot of needed reprints, like Lightning Strike, Chandra, and Foundry Street Denizen, as these are all critical to their respective builds. Enough build up though, lets dive into the cards. I’ll be reviewing most of the ones I think are worth talking about or are not recent reprints, so enjoy! 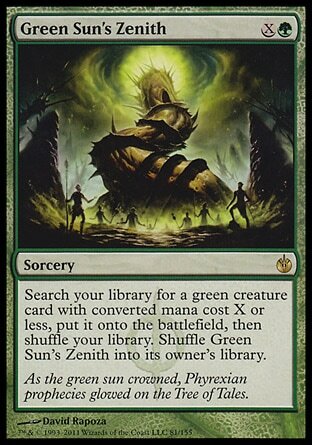 So, Wizards of the Coast made the Titan Cycle, which was wildly popular but also wildly overpowered. The cards dominated Standard deckbuilding for a long time, generated bans in EDH, and even saw some light Eternal play. 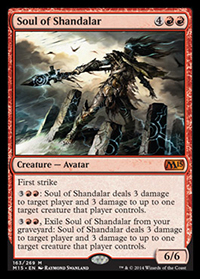 Soul of Shandalar is part of the new “fixed” versions, and honestly I’m not really sure what to think. Initial thought (and even mostly today) is that this card seems casual. I’ve seen some scary ramp decks in online playtesting, and if anything that’s where it looks like it could potentially find a home. 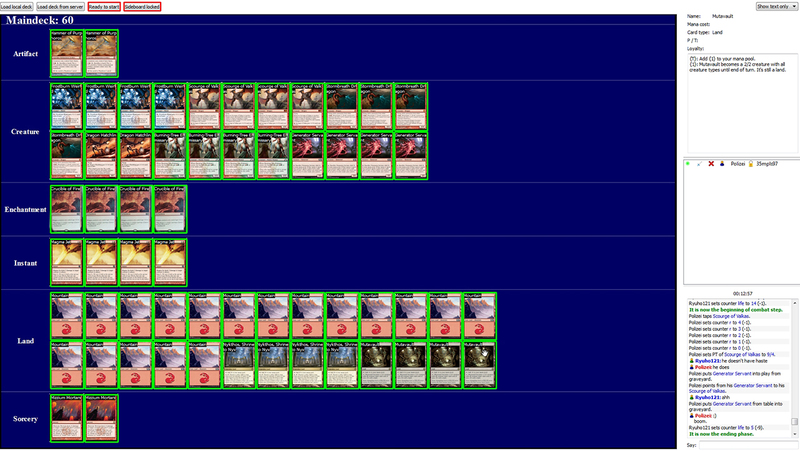 I tested some builds based off of the old RG Valakut lists, and while the Avatars “worked” they weren’t mind blowing. The biggest reason the Titans were so good was that they had an Enter-The-Battlefield trigger. That doesn’t require the creature to live to get value out of it, and they still provided repeatability like these do. Granted, you can use the exile ability on these cards if they do get removed right away, but at six mana to cast and five mana to use the ability, that’s a lot to ask! There’s also the other issue of what deck wants this and what ramp cards are available. 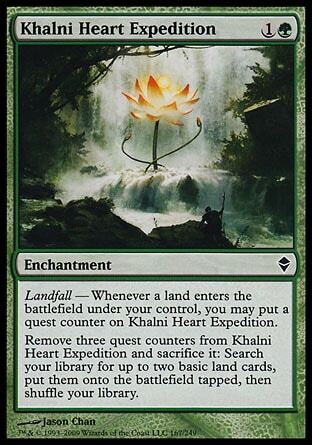 In the days of Valakut Standard, we had Solemn Simulacrum (aptly nicknamed SpeedBump), Cultivate, Khalni Heart Expedition, Rampant Growth, Explore, Green Sun’s Zenith, and Summoning Trap. That’s a ton of fantastic options, none of which we have today and no comparisons in sight. 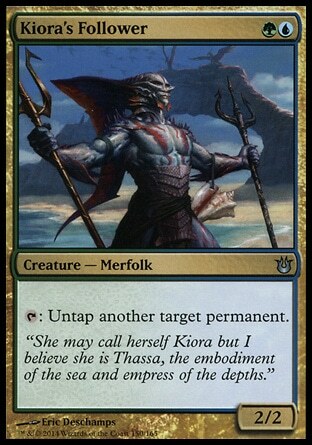 Nykthos would be the easiest shell to work with, but that restricts you somewhat on which Avatars you can use and also is a six drop for a deck that wasn’t really asking for one nor played one before. Why would I want this card when I could be casting Stormbreath Dragon and then monstrosing it. Soul of Shandalar furthermore doesn’t have evasion, which is a required feature for a six drop in my book most of the time. 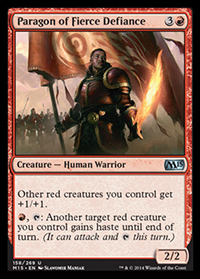 I would love to hear more discussion on this card, because like every other Red player I hold out an extended hand of hope that someone smarter than me makes this a thing. It’s just going to be a really uphill battle. . .
Altac Bloodseeker is a sleeper. Think about what enables this card, and think about the deck it’s going to be in. He is a perfect fit for a Mono Red Aggro deck, and typically in that style of deck you are going to be killing their creatures. 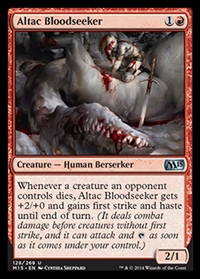 While he’s just a grizzly bear against Control, he’s an essential race tool against any other creature based deck. His +2/+0 first strike ability will ensure that he goes unblocked or kills something else, and if they only had one creature in the way that could block to begin with he’s 4 damage for 2 mana. While the haste ability seems irrelevant, it’s actually important here in my opinion. There will be many situations where you play this guy alongside of a Shock or a Lightning Strike and then his power truly shines. The only drawbacks for him (besides the Control issue mentioned) is that he isn’t great for devotion and he has a lot of competition. 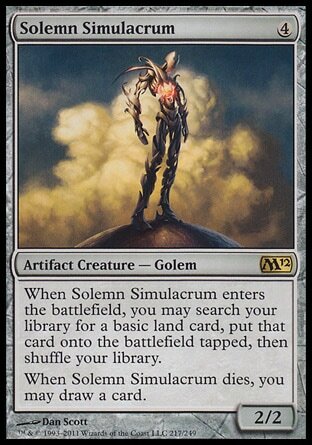 But M15 will be around for a long time, so when rotation hits or potentially even before, this guy should be on your shortlist of playtest consideration. Ash Zealot is also rotating soon, and this guy fits even easier into say a R/G shell with Ghor-Clan Rampager. . . While I’d love Standard to have a competitive Slivers deck, I think it’s going to be an extreme longshot. That said, M15 brought a lot to the table and there is small buzzing amongst Pros in the game. 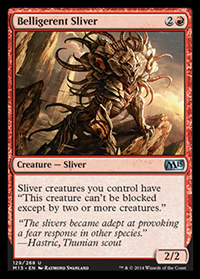 I absolutely love the effect this particular Sliver has; it’s easily my favorite Red ability. 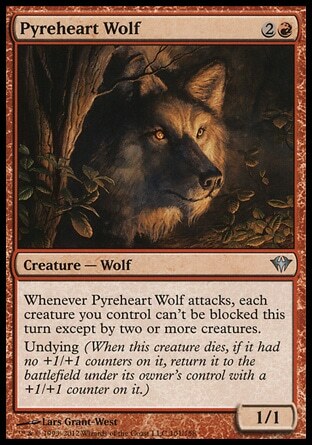 Pyreheart Wolf was by far one of my favorite Red cards of all time, and this guy knocks on that same door. At the very least, the new Slivers should provide EDH decks with a boost and possibly Legacy. A free card (essentially) is never something I’ll just pass on when considering options, but the playability here is highly questionable. I can’t see a deck in mind that wants this, aside from being a cute combat trick in limited. Even there, this card is a bit narrow. I like that it will exist, but I can’t see myself putting it into anything, even a Tom Ross style Boss Sligh deck. This is a worthwhile reprint that will add some great flexibility to Red Aggro decks. The “can’t block” clause is one of the most important there is in a world of large monsters, and paying R for it is completely reasonable. It’s also one more effect of this kind in a format with multiple efficient ways of doing the same thing, so I like that it’s here again. 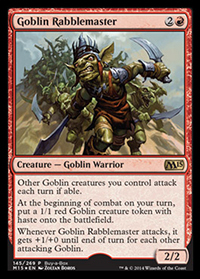 It sits appropriately on the curve, since all the other “can’t block” cards at 1CC are non-creatures and it’s a Goblin which gives one more thing to that archetype if it comes to life. I don’t like that it’s only a 1/1 when there are so many great 2 power creatures for one mana in this format, but I strongly believe this will have a few homes. Hammerhand actually seems pretty awesome for a Heroic deck, and while it has competition from Blinding Flare, I think it’s the better of the two most of the time. Blinding Flare is often only needed without Strive, although there are occasions where that option becomes a blowout, but Hammerhand’s pump and haste enabler clause give it a lot more mileage. I’m thinking this is one of those cards you want to play as a “miser” but I wouldn’t be surprised if it was jammed more heavily in the right deck. I think this is one that benefits greatly from playtesting to see how powerful it is, with the main drawback being that like any enchantment it can lead to removal 2-for-1s. Still, sweet card is sweet. HOLY BUSTIDO BATMAN! This card is ripe for some crazytown, that is for sure. I think he might be very quiet in Standard, but boy howdy does this look saucy for EDH and Eternal. 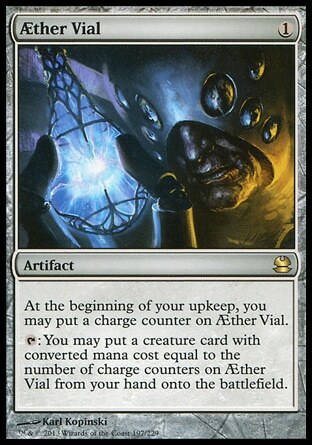 Lets look at some possible combinations here: Trading Post, AEther Vial, Mimic Vat, Brittle Eiffigy, Contagion Engine, Burnished Hart, Planar Portal, etc. That’s not even that good yet nor scratching the surface, this guy is begging to be abused. He’s also just a really cool build around General. 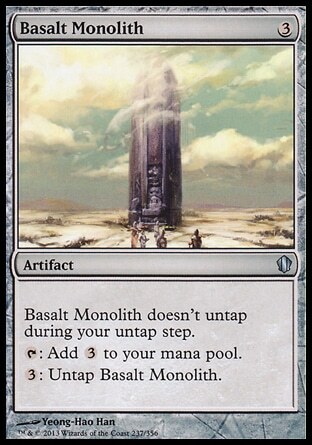 I’m sure there’s a whole bunch of infinite combos lurking, or even valuetown stuff like Basalt Monolith‘s untap ability. This is certainly a card I can get behind. This card should see play, if even only as a 1 or 2-of. Wizards has been pushing this effect, and as we’ve seen from Chandra and Prophetic Flamespeaker it’s a useable one across multiple formats. I don’t think Act on Impulse is a huge contender for Standard, although Burn was playing Wild Guess for a while and this seems like a strict upgrade. Needing to find a high-impact burn spell to finish someone off in combination with this card is perfectly reasonable. 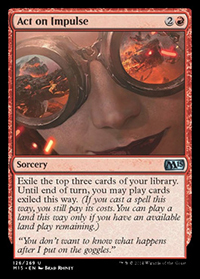 Granted, Burn doesn’t get to five mana terribly often, but situations will come up, and this allows you to play a land to help out its cause. What’s more interesting is the way to look at the card and also its Eternal applications. 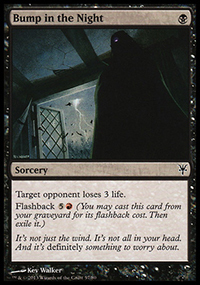 Essentially, this card in a lot of situations is saying 2R: Draw Three Cards. Red doesn’t really have a comparison, and there’s a lot of interesting situations I could see being created as a result. Lets look simply at Legacy Burn even though I don’t think it’s the best example. Legacy Burn plays Sulfuric Vortex (admittedly one of the best cards and a reason to play a 3CC spell when you otherwise wouldn’t), but for the sake of example lets just say you were playing Act on Impulse alongside of it. You cast Act on Impulse. You play a land with it. You Fireblast your opponent by sacking two mountains, and you cast a Lightning Bolt. That’s pretty nuts, and actually looks like a competitive closer in “some” amount of games. 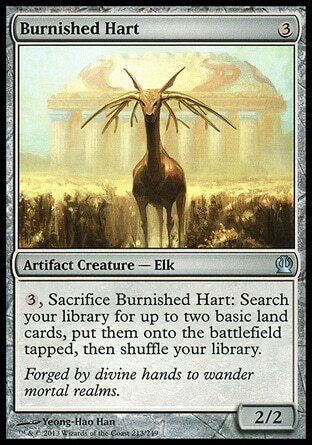 What’s one of the ways Burn tends to lose in Legacy outside of strict hosers? It runs out of cards. I want to try this as a 1 or 2 of, and I’m curious to hear others thoughts on it. 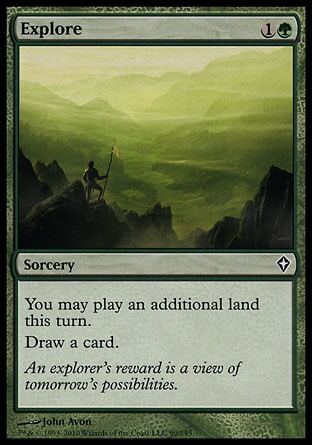 There’s something intangible about this card that asks us as a community to try and push it and see what happens. With that concept in mind, I think there’s some combo deck applications here as well, as this card seems like it could go bananas in Storm or something similar. And I can already imagine that the foil version is going to be insane, at least if they make the goggles part foil. M15 appears to be the set for “abuse” and Generator Servant is no exception. A lot of people will do the terrible, casual dismissal of “well, it dies to removal” or “yeah but it’s a one-time use spell” but this guy has some serious implications. Imagine playing a Stormbreath Dragon on turn 3. 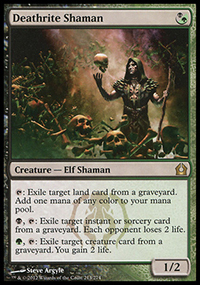 How about even the new Soul of Shandalar on turn 3 or 4 with haste (with Elvish Mystic in combination). 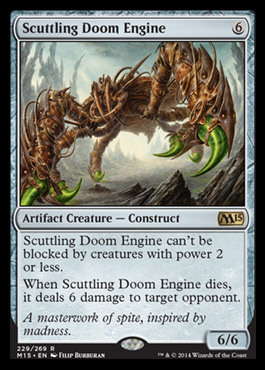 Or my Standard sleeper pick Scuttling Doom Engine which would just be unreal if they don’t have an exile spell to deal with it. Get your foil playset now. . .
I’m only including Borderland Marauder in this article because it’s somewhat comparable to Gore-House Chainwalker, and as a result I think it’s worth a mention. While the current Standard format is not asking for this card, there may be a point where a cheap Red deck needs this sort of thing. Post rotation, if we’re left with limited options in Aggro, she’s not the worst. 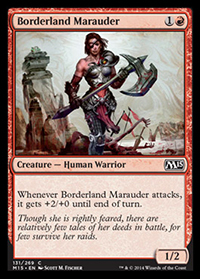 She’s also a Human Warrior, two sub-types that are relevant to a lot of cards. Brood Keeper isn’t anything to write home about, but she looks really fun for EDH decks built around an enchantress theme and also appears to be a possible Limited bomb. Free creatures that have flying and firebreathing is nothing to sneeze at in Limited, and this set includes many solid auras in Red alone. Very cool mechanic, and not one traditionally put in Red. 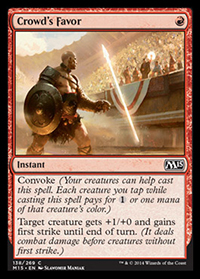 While I personally didn’t play much when “Convoke” was in Standard, this card looks powerful to me. I’ve already seen some Pros writing about it positively, and this is a replacement for Mizzium Mortars in a lot of decks not to mention just being better than it a lot of the time. The fact that it can go to the face is huge, and while you don’t want to be tapping your creatures for other purposes in an Aggro deck, this is a card that answers some of the bigger problems they have. 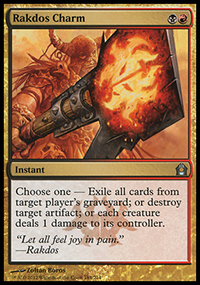 It’s also solid redundancy with Mizzium Mortars if you need more of this type of effect, and it potentially gives Standard Burn another weapon. There’s the situations where you play it alongside of some creatures as well, and the the drawback doesn’t feel nearly as bad. And lastly, it can at times be played completely for free, which just feels bonkers. 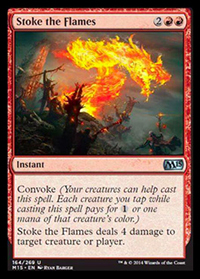 Can you imagine being stalled on board and tapping 4 mana for a Warleader’s Helix and also tapping 4 of your creatures to cast Stoke the Flames? Sign me up. I’m really mad at this guy right now. 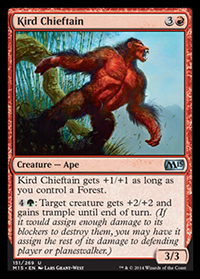 It’s probably blinding me a little bit, but as many of my readers know I announced on Facebook that Kird Ape was returning, and then we got Chieftain instead. I had read on what I thought was a reliable Twitter feed that a Kird Ape reprint had been confirmed, and had saw someone else mention that there was an official WOTC page talking about it. Turns out all of this was bunk, and instead we get this 4-mana low-life. Hoo Boy was I disappointed (along with the rest of my internet circle). BUT, I don’t think he’s unplayable. Red needs a little more from a 4-drop, but there’s a sense to me that there will be a build in which he can be the four drop, mainly because his ability is quite powerful. He could even just be a 1-of and still make an impact, since he provides you with an out to stalls and situations where you’re outclassed. I’m not ruling this guy out just yet. My thoughts regarding Aggressive Mining are almost exactly the same as Adrian Sullivan’s from his article HERE. It’s a card that looks like a very fine addition to Red, but the drawback is one that potentially could make it hard to use in many situations. I think this card will largely be an anti-Control sideboard card or a combo breaker of sorts in decks that don’t need lands after a certain point. It actually reminds me a lot of Burning Earth because it’s functionally filling a similar role, has the same casting cost, and has drawbacks as well. I think it’s worth picking this card up, as I can’t imagine that it will go untouched. If it doesn’t see play in one format, it certainly will in another. This cycle of cards is quite intriguing. While I’m surprised it doesn’t cost three mana like many of the other “Lord” cards in Magic, it looks like there’s something useful here. These days, many Aggro decks don’t need a Crusade-effect as they’re just looking for active-use cards, but whenever a Crusade-effect is on a stick (creature), it’s worth taking note. This guy is about as lackluster (a little more-so) as Fanatic of Mogis is against Control, but he’s also capable of a similar level of blowouts (despite the lack of reach). I wish I had a list for you readers playtested and ready to go with regards to him, but I don’t just quite yet. The biggest thing I can say at the moment is to actually try this guy in your Aggro deck, because something tells me he deserves to see play immediately. Could be quite the pair with Hall of Triumph too. 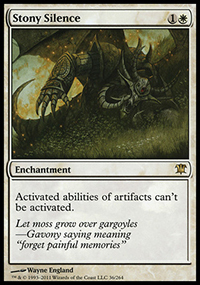 . .
Of all the cards in M15, this is the one I’ve been playtesting with the most, and he’s very strong. I don’t know what home is the de-facto best one yet and my lists are very rough even at this point but I know he’s going to get play. 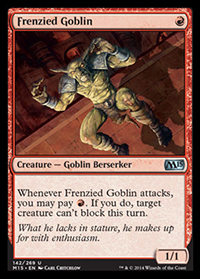 The easiest comparison card is one that is still a Legacy staple, Goblin Piledriver. 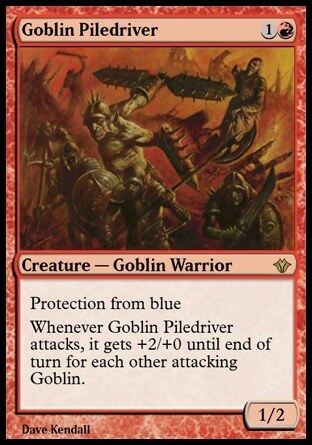 Anyone who’s played Legacy Goblins can tell you that Piledriver is an essential piece to the deck, and a large part if not the key part in its early turn wins. Rabblemaster loses Protection from Blue, has less of a power bonus, and costs one more mana, which are all incredibly important in Legacy, but this doesn’t mean he isn’t playable there and those points are far less relevant in Standard/Modern. He also has the ability to create a free creature a turn, and from playtesting I can tell you first hand that this ability is incredible. 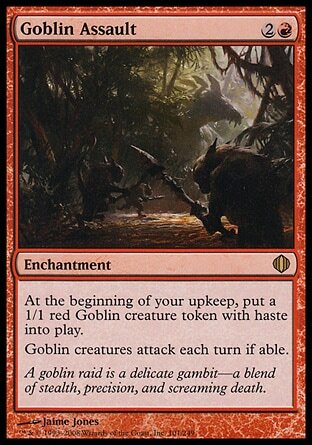 Combining Goblin Assault with Goblin Piledriver for the essentially the same mana is the Bees Knees, and I’m eagerly waiting to pop this guy into my Purphoros EDH deck. 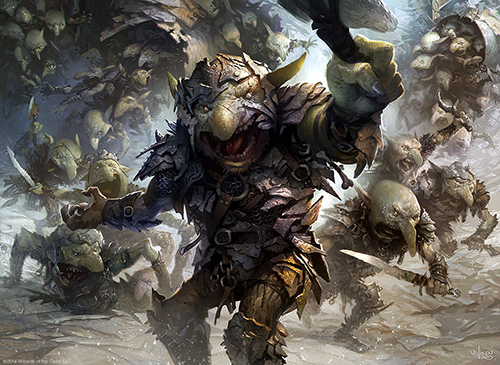 In Standard and Modern, IF there are enough Goblins and supporters to make it work, he could be the defining card that glues it all together. So far in playtesting, if my opponent didn’t kill him with removal or counter him, they typically lost. Easily the card I’m most excited for from M15. To me this card is looking at EDH and Limited. In both of those areas, we’re talking about a powerful effect that is heightened by the fact that it gives the ability to the creature meaning that you don’t have to wait a turn to use it. 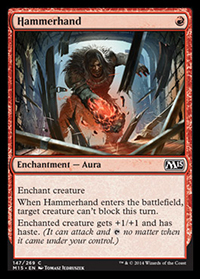 Typically in EDH these kind of Red cards have been powerful (at least when my buddies and I play “fun” Multiplayer), and if you put this on a hexproof or indestructible guy. . . GEEZUUUUS. Seems like it could be super busted with cards like Kiora’s Follower too, I can only imagine the impending Rage-Quits. 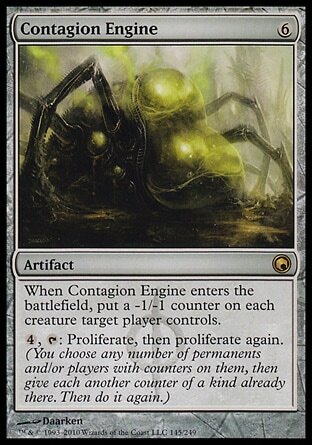 Oh, and don’t forget about Infect. . . 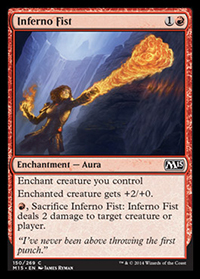 The last card I’m going to talk about today is Inferno Fist. It appeared to get the most buzz during the spoiler season, and ultimately came out a little different once the final version was unleashed on the internet. There are shells where this card can see play, Heroic seeming to be the most likely. 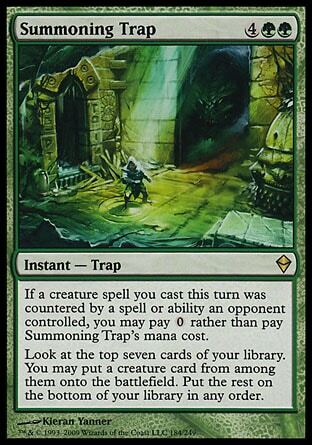 Overall it may just be a great card in general since once you get to more than 2 mana you can gain more value than the card is worth most of the time. The biggest problems are that since the final version doesn’t boost toughness this card doesn’t save any creatures or allow them to leapfrog your opponents creatures, and it’s an enchantment so it’s vulnerable to 2-for-1s just like any other. Madcap Skills set the bar for what risky enchantments you’re willing to play with in your competitive deck, and its made playable enchantments a hard nut to crack as a result. I believe Inferno Fist passes the test because the second ability gives it reach and removal, the two all-important holy grails of Red Aggro. Like some of the cards mentioned before, get your foil playsets of this one :). I’ll be at Mox Mania in Madison, WI for the midnight release, looking forward to an exciting new Sealed format. Hope to see some of you there and good luck wherever you are! Welcome back. Usually on my website I’m talking about Standard, but today I’d like to focus on Modern. I originally wasn’t planning on playing in this PTQ season, or if so it would most likely have been with a non-Red archetype, but some developments caught my attention. A few days ago I decided to take the plunge and purchased most of the remaining cards I needed for the decks I’ve looked at, and have begun testing. Bump in the Night lets you add another Lightning Bolt to the deck and as a result your clock improves (there’s also the occasional games where it flashes back). Deathrite Shaman (now banned) adds another Grim Lavamancer to the deck who also has the ability to eat your opponents cards, tame Tarmogoyf, and if you’re running a small green splash; win races. 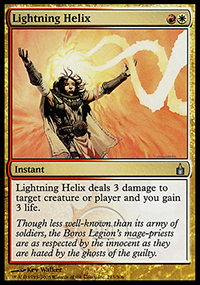 Lightning Helix is another great card in a race, along with giving the deck yet another efficient removal spell. 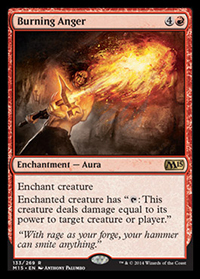 Rakdos Charm adds an otherwise inaccessible ability to fight Twin and Kiki-Pod (even though there are occasions to play around it), doubles as affinity hate, and wipes yards against the decks that the first ability is relevant against. Lastly, Stony Silence gives you a great flexible card against the format, with Pod, Tron, and Affinity specifically in mind. It’s not just these cards though, there were many variations of Burn out there that employed these basic principals. I personally like a deck that has a little more “game” to it (in the sense of creatures and enchantments), but I will admit that multi-colored Burn looked far more appealing than straight-red which seemed basically unplayable. Jasper went 7-2 in the constructed portion of the PT, so his list is a force to be reckoned with, that much is for sure. He’s played variants of it before and consistently done well, so if this style is your flavor then by all means have at it. For those of you with more beatdown roots in mind, I think you’ll find the next two lists a bit more interesting. In the short amount of time I’ve had playtesting his list, the results have been very promising. As he discusses in his deck tech, every card was very well thought out. This deck has all the elements of a great aggro deck, and it specifically punishes the current Modern format. He went 8-1 on day 1 of the Grand Prix, and there’s not a lot here so far that I would change. I’m not 100% sold on Mogg Fanatic or the sideboard, but as I get more of a chance to test I should be able to get another article up with the direction I think it should go. For now, if there was a big Modern tournament tomorrow and I had all the cards for this, I would dive in without looking back. But like I said, “If I had the cards for this”. Thankfully Madison has a large and friendly Magic community, so I can usually borrow if I need to, but for me part of my love for the game is owning the cards that I thrash my opponent with. This reality is becoming less realistic as time goes on, but especially for a Red player, it’s a matter of pride that isn’t easily discarded. I like it when I beat your $2,000 deck with my pile of commons. There’s a real satisfaction there. Especially when it’s done with “skill”, something which many non-Red players disregard. 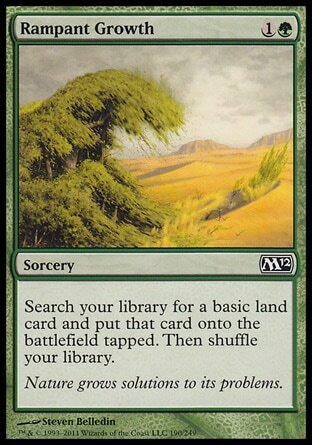 This has many of the elements that Nicholas’s list has, except there is a reduced land count to account for the lack of fetch-land filtering, and the sideboard isn’t quite as robust. It’s still a very powerful list if you simply want to sit down at a Modern tournament and play and have an OK chance of success. I also haven’t fully tested this, like Nicholas’s list, but in early testing one of the big things that stuck out to me was that Brute Force probably needs to be replaced. It doesn’t protect your creatures from many of the removal spells in the format, and it’s creature dependent, so at this point it should probably just be Rift Bolt or something similar. I’m also not sure I’m wild about the creature suite, but it has more of an aggro feel which is always nice. The problem is that the format can deal with aggro easier than it can deal with Burn, so a mix towards the latter end is probably a necessity. 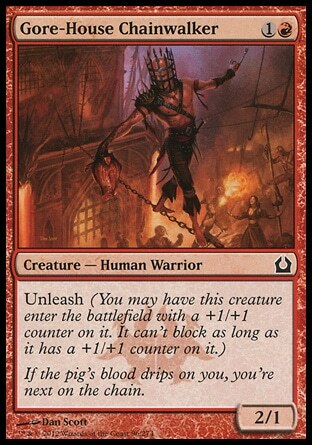 Blood Moon most likely needs an increase in the sideboard despite being an expensive card, as it’s just a beating to many decks, especially combo decks which are aggro’s main weakness in Modern. Nicholas also runs Molten Rain which was a format all-star for me when I ran Jund and is one of the best ways to bring some pain to UWR which is an otherwise difficult matchup. 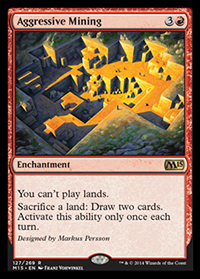 Being able to mess with their lands is something traditional Red Deck Wins was based on, and killing manlands like Celestial Collonade is important to keeping them from advancing their late game. 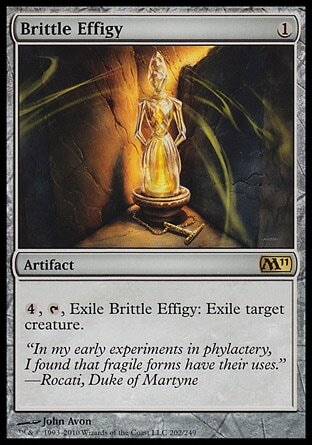 On a final note, many Burn spells are more efficient than creatures, so you need to keep that in mind when making adjustments because you still want to be able to race the fastest decks in the format. Modern and Legacy are so much more a battle of “regularly competing for the average turn kill” than Standard, and I feel like this point is often lost when people begin the brewing process. If you can’t kill them fast enough, you need to be able to disrupt, so both these elements are the hyper-critical areas of focus for RDW. I haven’t been ignoring Standard completely with my recent attention towards Modern. In fact, I’ve been succeeding well on the local level. As I’m sure I’ve mentioned in previous articles, there are win-a-box tournaments every week in my hometown and the competition tends to be very good. Often times many of us joke that we’ll do exceptionally well at a big tournament only to return back to our shop and go 2-2. Part of that is variance and metagame differences, but another large part of it is the level of play here in Madison. A few months ago another shop in our town started doing their own win-a-boxes, so we now have two that occur on Tuesdays and Thursdays. Pay $10, bring your Standard deck, and battle for a chance at some sweet prize booty. There are other choices for Red Aggro out there at the moment, but I feel this list balances the best against the format. You have some longevity, and you have just enough speed to punish the decks that can’t keep up. I’d easily recommend it going forward, and feel free to adjust a few numbers based on your Meta.